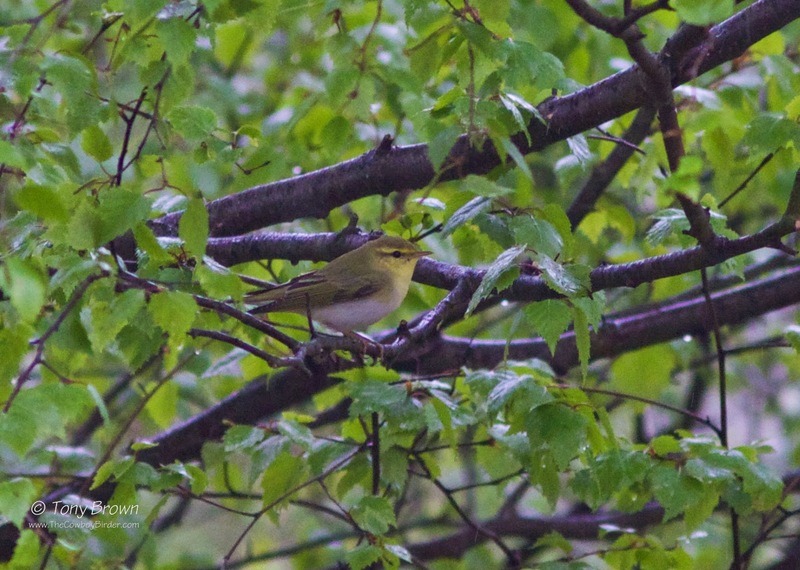 In 1952 when Gene Kelly performed singing in the rain who would have thought that wonderful performance would ever have been eclipsed, well a Wood Warbler on Wanstead Flats certainly gave Gene a run for his money. With a wet and overcast morning forecast, I was hopeful these spring conditions would drop in a few additional summer migrants, but with only a handful of the usual Blackcaps, Chiffchaffs, Whitethroats and Lesser Whitethroats on offer first thing, I was keen to add the recently arrived Garden Warbler to the patch year list. So after polishing off the now regular and most welcome Saturday morning Costa Coffee with the usual Wanstead stalwarts, I sloped off to add Garden Warbler to the totals. 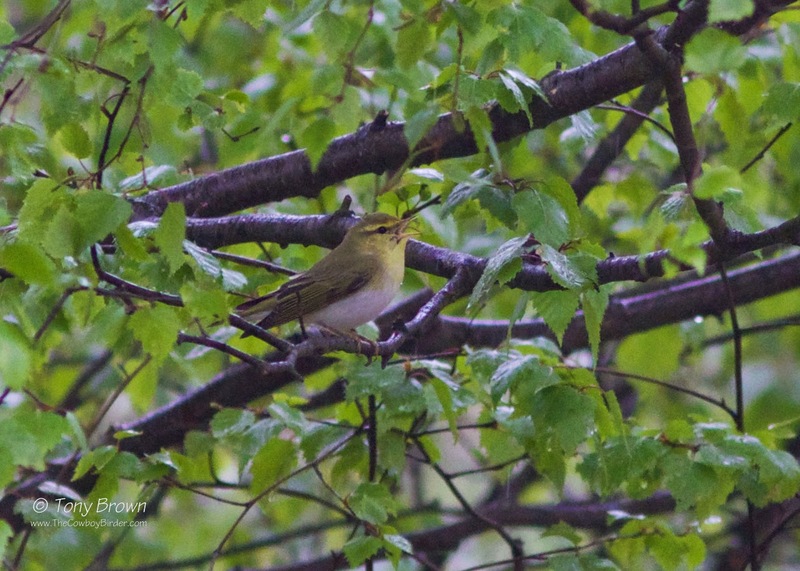 I soon found the Garden Warbler singing between Motorcycle Wood and the Birch trees in the SSSI and I was just pulling the camera out from its rain protector when a warbler flitted into view, even without raising my bins, I could see how strong and bright lemon yellow the upper parts were, bloody hell - WOOD WARBLER. 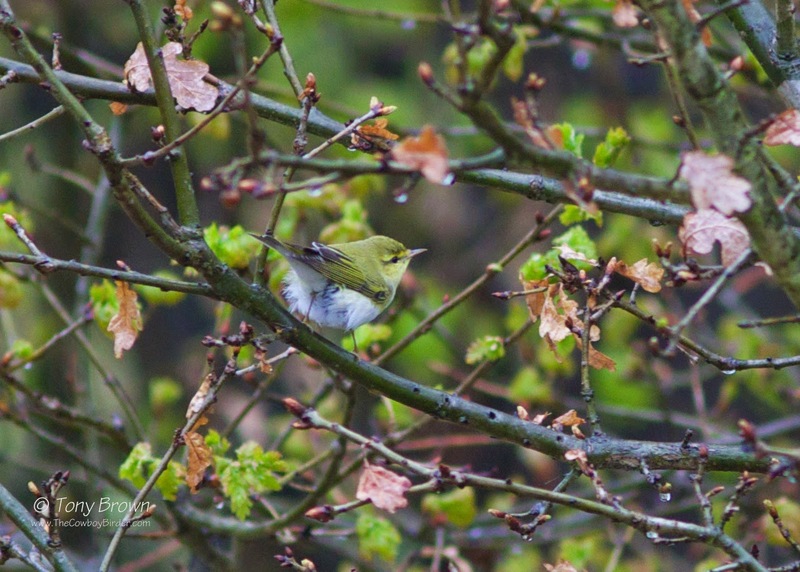 Now pointing the camera in the direction of the Wood Warbler it only goes and breaks into song - this was stuff of patch dreams! 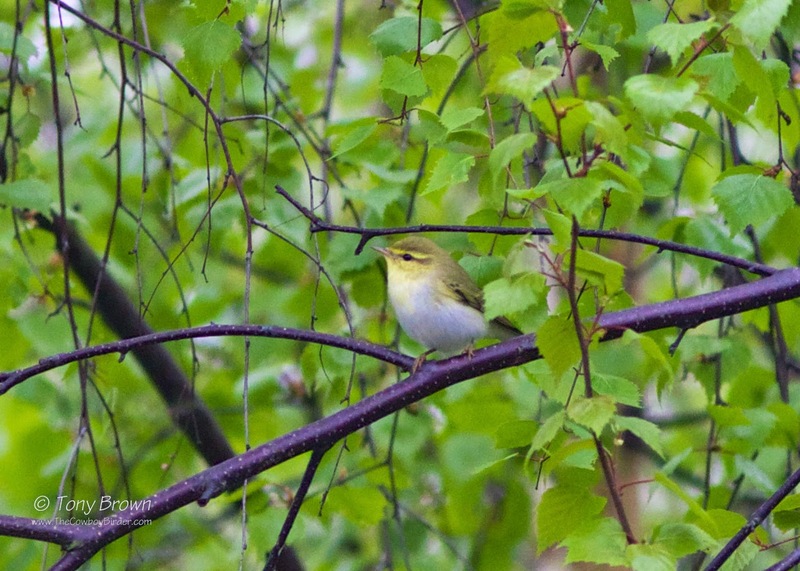 A quick phone call to alert my caffeine addicted Wanstead birding colleagues, I did my best to keep track of its movements through the Birch copse - knowing full well how good a bird Wood Warbler is, not just for the patch but for London in general. Shortly after the whole Wanstead crew (Jono, Dan, Nick, Bob, Stuart and a breathless Tim - having sprinted from home) were also all enjoying wonderful views and listening to that soft trill in the rain. I soon had to leave the Flats as parental duties called - but for the rest of the day I couldn't get that song out of my head - Dee-ah dee-ah dee-ah, Dee-ah dee-ah dee-ah - I'm happy again, I'm singin' and dancin' in the rain!